Mrs. Violette is always encouraging me to go deeper into my writing. She truly pushes her students to be the best they can be and always challenges us. Passion is never something that she lacks and that passion rubs off onto her students. Mrs. Violette isn’t one to hold back criticism and I am better for it. Over the course of the year I have seen my writing improve more than I thought it could. Mrs. Violette is the teacher that will always go the extra mile for her students. Olympia High School is lucky to have her as a teacher and so am I. Well said Bella. 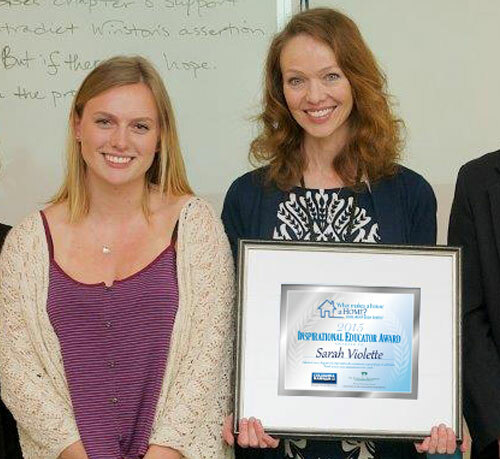 Congratulations again to Sarah Violette – another teacher making our community a great place to live!